Some of this website in now available in French! View documents in the document archive that tell us about the efforts of civilians to provide comfort and necessities to soldiers overseas. Saanich farmers produced a wide variety of foods that supported the Victorian market. Residents were also encouraged to grow their own food in order to preserve food stocks for soldiers overseas. Click here to learn more. Certaines sections du site sont disponibles en français. 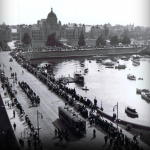 The very diverse experience of Canadians during the Great War 1914-1918 has been largely obscured by dominant national histories both in print and on-line. Although the national story remains important, we recognize that the way individuals experienced the war varied greatly from community to community. The farmer in Trois Rivieres, the office worker in Toronto and the Chinese merchant in Victoria lived through those turbulent times in very different ways. Their attitudes and decisions were shaped more by their local circumstances than by any grand national theme. Religion, education, geography, class, gender and ethnic origin all played a role. Our focus allows us to gather together a useful body of primary source material in an on-line archive together with a robust set of service records to support research into the lived experience of the very diverse communities that are the component parts of our cities. For our purposes, a community might be defined by a local neighbourhood, a common workplace, a place of worship, a school or even membership in a social club or sports team. These very local communities can have a powerful influence on attitudes and behavior particularly during times of dramatic change. 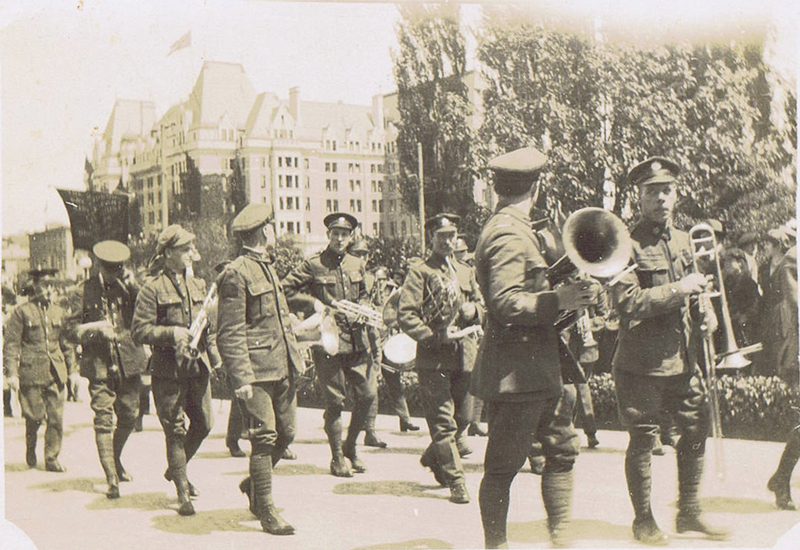 Our aim is to tell the stories of these diverse communities by providing a digital platform for researchers studying Canadian cities in the Great War. The site has been launched using the City of Victoria as a model for the approach. The Victoria site provides some initial contextual material to set the stage for the researcher. Research is supported by an on-line archive of primary source material and a database of over 6000 service records. 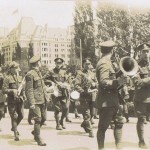 During the four years spanning the Great War centennial, the History Department at the University of Victoria will offer a microhistory course that will lead teams of researchers to work with community groups, develop additional linked micro-history web sites, and add further material to the archive and records of service database available on this site. The Saanich Archives has generously supported A City Goes to War by contributing more than 100 documents to the document archive. You can learn more about Saanich and view documents relating to Saanich under the “Cities” tab at the top of the page. Our teaching package encourages students and teachers in secondary schools to begin the fascinating detective work that is the essence of historical research. Although the initial set of material is focused on Victoria, it is easily adaptable to other communities. Students can explore the history of their community by building a “Fakebook” page that parallels the popular Facebook model using primary source material about real people. As researchers work with our material, we invited them to share additional archival material uncovered by their research. We also offer a peer reviewed platform for the publication of that research by hosting micro-history websites developed primarily in a WordPress environment. Any research material added to this site will be covered by a creative commons license.